Additional science content, changing on a daily basis, will be presented in extensive poster halls, with refreshments provided in the early evening to stimulate and inspire lively discussion. The conference dinner will be the high spot of the social programme. 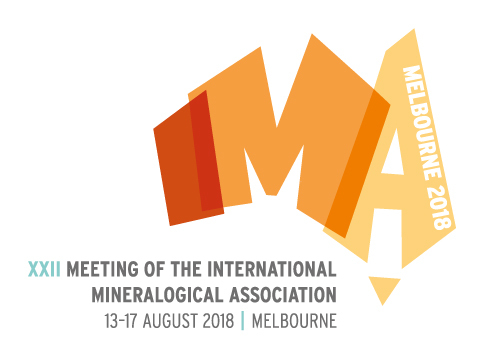 We will be running exhibition halls through the whole meeting, at which delegates can explore the commercial stands of instrument manufacturers, professional organisations, publishers and mineral dealers, and chat to exhibitors. Small meeting rooms in the centre will host business meetings for various committees of the IMA and other organisations. Field trips before and after the conference will give delegates a mineralogists’ eye view of a range of exotic Australasian landscapes, and we will also be organsiing and facilitating less scientifically oriented activites for accompanying persons, in the fascinating city of Melbourne and its hinterland. Robert F. Martin, editor The Canadian Mineralogist, has kindly let the Mineralogical Society of American host a set of International Mineralogical Association Commission on New Minerals and Mineral Names reports that were compiled by the Mineralogical Association of Canada and the Canadian Mineralogist on the occasion of the IMA 17th General Meeting in Toronto (August 1998). These reports are also available at the Mineralogical Association of Canada both as an electronic version and as a Booklet.